ver wanted to add vibrant, no-fade color and personality to your locks, but aren’t too crazy about using chemicals to do so? Felting may be your answer, and it couldn’t be easier. Just follow the four simple steps below and you’ll be looking felt-astic in no time! Important note: Felting is a way of adding permanent colour to dreadlocks – there is no way to remove it other than cutting out the felted portion of your lock. 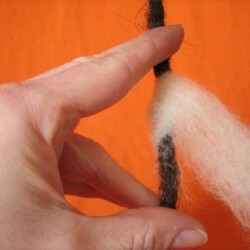 Wool Roving: this is not yarn! It’s wool that’s been combed and carded in preparation for being spun into yarn. It can come in a long dense strip or a clump, and is available in every shade of the rainbow. Felting Needle, Lock n Loop Tool or Lock Docta: a specialized barbed tool that can be picked up at a yarn supply or craft store. Band Aids: just in case of enthusiastic needle pokes to fingers and palms. Isolate the lock you’d like to add colour to. 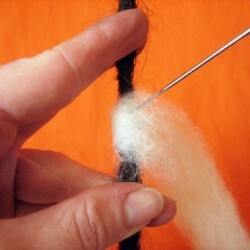 Separate a small piece of roving and wrap a piece of it tightly around the lock, twice. Before you begin to use the needle, make sure you’re holding your dread properly, like the photo on the right. Keep your hand away from the back of your lock to avoid a painful poke to the palm or fingers. Holding the wool against your dread, use the needle to push through to the other side of your lock. Pull needle back out and repeat the motion all the way around the dread to secure the wool inside the lock. Once secure, continue wrapping downward 2 inches at a time, pushing the needle in and out and securing the wool in the lock as you go. Don’t forget to rotate the lock and get all sides! When finished, check for any missing spots of colour. Add a little more roving where necessary. Finally, wet felting with a little hot water and palm roll the colour in. This will help bind those fibers tighter, and will continue to as you wash and dry your dreads in future. Tip: If you really want to lock the colour in from the start, add a little Knotty Boy Dread Shampoo now to your hot water, palmroll in, then gently rinse and dry. ‘Wet felting’ is a technique that is done with soap and water, as soap helps wool fibers bind together even more than with just hot water. Now the sky’s the limit for creating all kinds of colour blends and designs, customizing your luscious head o’ dreads!